Since adopting our beautiful black pug, Toby, we are happier than ever. He quickly became part of our family. At the beggining it took a little for our Betsy to get used to seeing Toby getting attention (she was a little jealous) but now she is over it and they are good friends. Toby is a funny and energetic boy. You will see the kids running after him because he stole a shoe or a sock from their room and will refuse to give it back, it is so much fun to watch!! Another thing he loves to do is ride in the car. When he hears the keys he is the first one at the door. I take him with me almost everywhere I go. Thanks to CPR I have a wonderful pet that loves me and follows me everywhere. My experience with CPR has been nothing but wonderful. 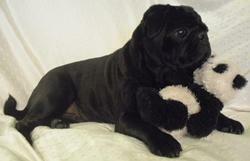 No one cares more for these pugs than CPR and they are doing a wonderful job! Thank you Marcia and CPR for all your help in the process. We will definitely talk to our friends and family about CPR. I hope you like our pictures.